Wireless Bluetooth speakers are plentiful these days. Big ones, small ones, good ones, awful ones; choosing one is difficult because you can’t often test-drive them in the store. The key features are similar: connection via cable or wirelessly via Bluetooth. 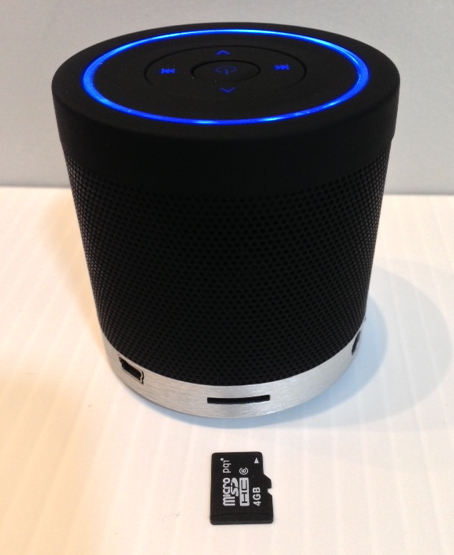 The Veho 360 Bluetooth Speaker offers a feature that most of the others don’t have—music via an SD card. The Veho 360 Bluetooth Speaker is self-powered with a rechargeable battery and will play for two hours via Bluetooth, four hours via SD card and five hours via direct cable (included). The clever bit is loading a MicroSD card with music from your computer and inserting it into a slot in the speaker’s base. The unit then becomes a tiny self-contained, self-powered music player. No wires, no external devices required. Here’s the thing—this device is tiny. A mere 2-1/4″ tall and 2-1/4″ in diameter; smaller than a tennis ball. Even at this size, the manufacturer has managed to squeeze two 2.2 watt speakers inside. The sound quality is surprisingly good considering its diminutive size. Don’t expect much bass, but there is plenty of volume. 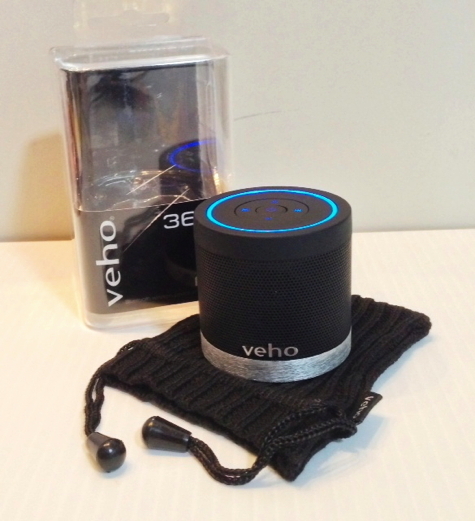 Packaged with the Veho 360 Bluetooth Speaker is a line-in audio cable, a USB charging cable, and a knit drawstring pouch. Charging the unit takes four hours the first time and only two hours for subsequent charges. On the bottom of the unit there is a switch for choosing Bluetooth connectivity or SD/Line-in. On top there are standard On/Off and volume Up/Down buttons. There are also Next/Previous track buttons for use when the SD card is installed. The inclusion of a slot for a MicroSD card is clever. One GB of memory equals about 100 songs and very large capacity SD cards are available now at reasonable prices. Playing music this way will probably run you out of battery charge way before you’ve listened to all the music on the card. Getting music onto an SD card is a skill that must be learned. On a Mac, you have to go into your iTunes library: Home Folder > Music > iTunes > iTunes Music and drag selected songs onto the card. Attempting to drag music and playlists from the iTunes app doesn’t work. On a PC, you drag songs from the folder in which your music is stored. Only MP3 and WMV files work with this device which, unfortunately, eliminates listening to audiobooks without file conversion. 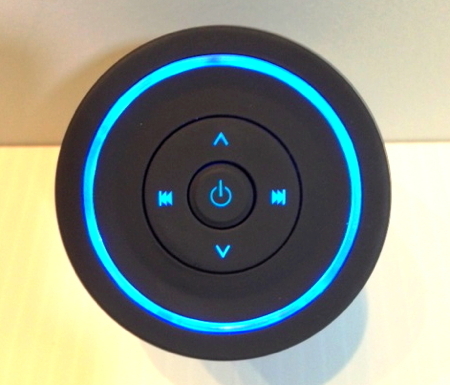 The ability to listen to music from a self-contained unit with no wires is clever and will make some users very happy. The sound quality from such a tiny unit lowers the rating a bit, but depending on your requirements and needs, this relatively inexpensive speaker is all kinds of fun.